The Pitch: "Bradley Cooper is prepared to make periodic appearance, schedule-willing." "'Kitchen Confidential' star Bradley Cooper?" "Is there any other Bradley Cooper?" "Sold." 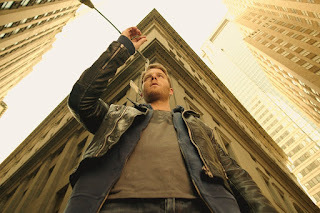 Quick Response: As a feature film, "Limitless" as kinda "Man-Lucy," a stylish and astoundingly stupid movie that suffered every second you stopped to ponder the plot, but moved fast enough that you rarely questioned its "Flowers For Algernon For The Digital/Pharmaceutical Age" conceit. And as a TV show, directed by Marc Webb, it functions exactly the same way. It's flashy, dumb fun for maybe 33 minutes, as Jake McDorman's Brian Finch pops a pill and goes from music-playing slacker to Chuck Bartowski in a matter of minutes, all through the power of neural enhancement that you really don't want to quibble with excessively. McDorman's voiceover adds casual humor and also will force at least five viewers to think of "Limitless" as a sequel to "Manhattan Love Story," while Webb plays around with different aesthetic representations of Finch's newfound powers, flashy devices ranging from contrasting color palettes, Jake McDorman duplication and manipulations of time and space. It's a pleasant distraction from the reality that after popping good ol' NZT, rather than becoming something new or different, the main character just becomes, as I said, Chuck or The Guy from "Intelligence" or, more frequently, the latest permutation in TV's insatiable appetite for Sherlock-esque sleuths whose ability to know literally everything is often much more creepy than endearing and is almost always a cop-out for writers. "Limitless" is, perhaps, even less believable than "Chuck" or "Intelligence" because of its insistence on justifying the mechanics of its premise. But you won't care until a time that is rather unfortunate. "Limitless" grinds to a halt at the exact moment that Bradley Cooper's Eddie Morra pops up to exposit on how "Limitless" will function as a weekly series, to introduce unnecessary secret-keeping and to stanch all narrative flow through an extended and lazily cut conversation that nobody was going to trim around, because when you have multi-Oscar nominee Bradley Cooper, you make sure every second of his footage appears on-screen. From there, "Limitless" becomes committed in setting the table for subsequent episodes and it's basically exactly like "Chuck" and "Intelligence" and every other "Gifted person and handler" series and you realize how little effort was put into expanding this world. And then there are backstory details introduced about Jennifer Carpenter's FBI agent -- so far a waste of Jennifer Carpenter's swearing dexterity -- that are, again, the sloppiest thing anybody could have conceived of to push all of this forward. And in a 10-minute period, I went from being ready to watch "Limitless" on a casual weekly basis -- It's just another variant on "Castle," "Forever," "Elementary" and any other show that might accompany folding laundry -- to putting "Limitless" on one-episode probation. Desire To Watch Again: Stupid shows about smart people are becoming part of CBS' brand and I really think the network would have paired "Limitless" with "Scorpion" except that a Monday 10 p.m. slot would have made the "Intelligence" comparisons -- Josh Holloway, Meaghan Ory and Marg Helgenberger can be traded straight-up for McDorman, Carpender and Mary Elizabeth Mastrantonio as character types -- entirely unavoidable. I'm curious about a second episode, but a lot will depend on how McDorman's character evolves -- the "Greek" veteran is prone to smugness as a default -- and how many of Webb's flourishes remain to keep the look fresh.